The first test of the year for the new squad proved to be a tough one. 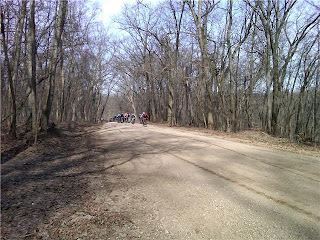 The season started off with year number two of the Barry-Roubaix. 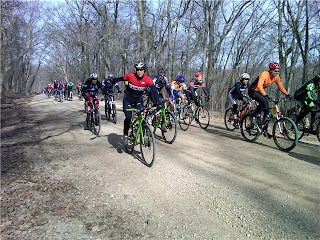 This 65 mile dirt road race is fast becoming the new spring classic in the midwest. The race provides varied distances by class. 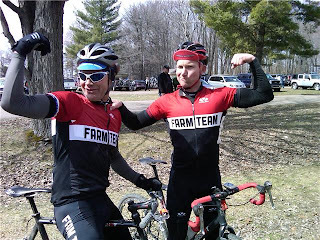 The Farm Team was represented well in the 65 mile elite field as well as the 35 mile single speed category. The morning started off sunny but cold for the almost 80 who started in the front with the elite field. After a couple miles of neutral roll out, it was go time. Everything seemed to stay together pretty well until the large group hit the mile or so of sandy two track. Between the attacks and a few jackknifed individuals, things started to break up a little. Three guys got off the front and a large chase group of about 20, including Dan Jansen and Farmer, went to work to pull them back. I was in the second group with about 10 just behind. The race went on from there. Every now and again we would pick up a straggler from the first group. Farmer leading the group on an ss. By lap two my group was down to four, and then two. Every so often we would come across a few defeated souls that had been shattered by the main field. In the end Jansen was able to put in a hard effort and break from the group crossing the line in 5th. 8 seconds later was the Farmer in 11th. I followed a few minutes after in 25th. Tara Jansen was looking for a women's elite podium shot, but was taken out in the first 4 miles in a pretty gnarley crash. A few solid bumps and bruises asside, she is doing just fine, and ready for the next race on the calendar. Joe Fro finished his day after 35 miles. He now has his sights set on the start of the NUE series. First stop is Cohutta in Tennessee. Joe Fro on his Green Machine. Scott Chambers rounded out the rest of the teams results with a solid 9th in the expert single speed category. Thanks to Steve and Shari for the bottle hand ups, and New Holland Brewing Co. for the post race beer! Thanks for reading.